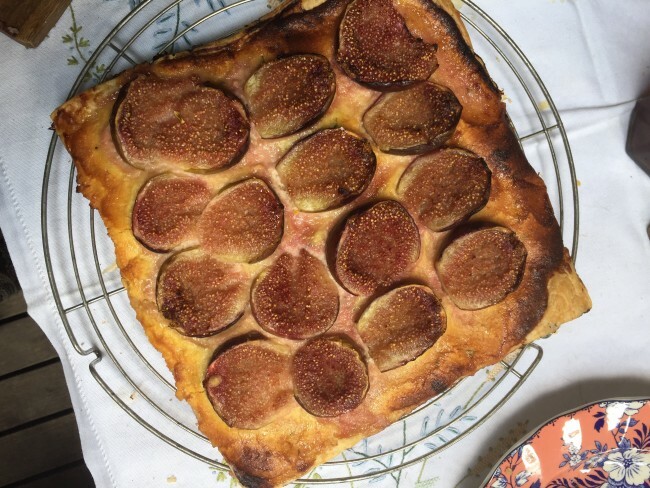 While the figs are in season I look for every opportunity to use them. 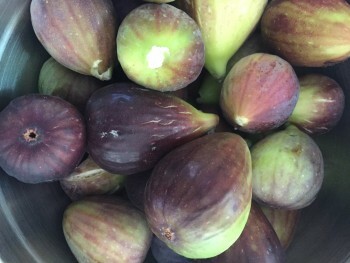 I’m not a big fan of fig jam – there are other types I like a lot better – which kills the easy default for dealing with a glut of garden fruit. I eat a couple for breakfast every day, sometimes another for dessert, but none of that really makes any headway on what’s available from the tree, even after the local wildlife have taken their share. I know they are only available for these few weeks, and I have to make the best use of them I can. Out of season, they’re not worth the effort. Which means I’m always looking for inspiration. 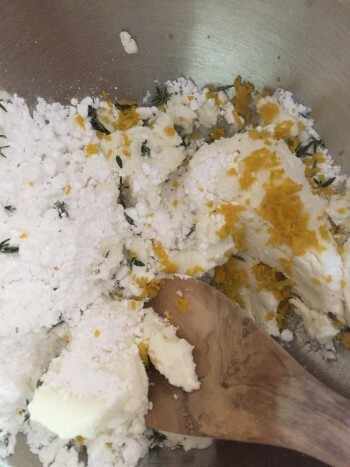 I found some, of course, in Yotam Ottolenghi’s Plenty More, which caught my eye because it happened to make use of one of my other favourite things, fresh goat’s cheese. I was preparing lunch for a friend who’s a vegetarian, so it was perfect in lots of ways. I knew that figs and goat’s cheese was a combination she would love. I only had to see those two names nestled together in the cookbook and I was convinced. I used more orange zest than asked for, and it was still subtle. The recipe includes instructions for a butter puff pastry base, but also (very unexpectedly) says it’s fine to use store bought. I didn’t have time to make puff pastry from scratch (and to be truthful, puff pastry intimidates me a little), so I went with the easy option. Take about 600g figs, trim the stem ends and cut in half. Lay them tightly on the base, cut side up, lightly overlapping each other because they’ll shrink a little when they cook. Brush remaining egg over the edges of the tart. Place in 190C oven (170C fan-forced) for about 30 minutes. Mix 75g icing sugar with 1 1/2 tbs lemon juice to make a sauce that can be spooned over the top of the figs when it comes out of the oven. Sprinkle with a few thyme leaves. Version 2: So pretty! Maybe not as pretty as Yotam’s, but still very happy with it. What went wrong: I made two tarts (the store bought sheets are smaller than the size in the recipe) and put them in the oven at fan-forced 175C (I’ve said before, my oven runs a bit cool). 15 minutes in, I swapped them over. They didn’t look ready after 30 minutes so I pushed the temp up a little and left them for another 7 minutes. There was quite a lot of fig juice that had run into the baking tray. I took one tart out and we ate most of it, but I could see the pastry could do with more cooking. I took the second tart and cooked it on its own for another 7 minutes in a conventional oven (not fan-forced) at 195C. This time when I took it out, it looked much more like it was supposed to, and the puff was crisp enough to move the whole thing easily onto a wire tray. I can also see that it would be better with the slightly thicker puff base you could get when you make the pastry yourself. I will (I will!) try that next time. The lesson: With pastry, it’s probably better not to try to cook two at once, since the underside of the pastry does not get enough direct heat and doesn’t cook properly. Verdict: Still really delicious. Such a magnificent combination of flavours makes for a wonderful late summer/autumn lunch dish. Corinna Hente on Please, can I have some more?